It is all his grandmother’s fault. There’s a Star Wars quality to the sight of half a dozen of his Tentsile tree tents floating mid-air in the woods. Their night lights cast an eerie, multi-coloured glow around. Alex Shirley-Smith remembers the dream of such a vista beginning when she took him, aged 6, to see Return of the Jedi. Only a few weeks before he had watched a BBC news film on the destruction of the Amazon rain forest. Why can’t we live with trees and not destroy them, he asked. Thirty years on and he has delivered the kind of Wow factor that wins converts, grabs followers on the internet and is building sales for a unique product. Alex and his business partner Kirk Kirchev are also the kind of developers who offer to plant three trees for each and every one of their tents that you buy. Why three? Because the tents are suspended a metre and a half off the ground, held in place by ratchet-tightened straps between three tree trunks. Clearly not a product worth taking with you on a voyage through the centre of the Sahara or on to the Russian Steppes, but it’s perfect for venture camping most places else. Photo courtesy of Travis Burke. Getting it right took many years. Alex kept hold of his dream, became an architect and started to work for what you might call a ‘mainstream’ tree house company. He first modelled a possible tensile textile structure between three points when he was still a student in 2002. What he was after was not a hammock that swings off two points, but a stable, liveable space, a real, but portable, tree house. The basic idea was one thing, its practical application proved to be much more complicated. Alex had no backers and knew little of the very different properties of textiles, even less about sewing – and there was next to nothing in the technical literature to help him. What he did know was that a tensioned structure can find its own space and stability inside any acute angled triangle, so he needed no more than three fixed points, just those three trees. His early, rudimentary but complicated, ideas were featured on a green product web site in the spring of 2012. It was picked up by BBC TV. In just one day his own website had 40,000 hits and crashed. One of them was by Kirk. He brought the vital product development understanding that converted the first complex designs into a simple reality. Deceptively simple: it still took 14 failed prototypes to get there. Even though now it all seems so obvious, it was a step into the unknown. Busy with design and development, Alex got a specialist lawyer to help with patent applications and has stayed with the same firm ever since. The first sales came in 2013. April 2014 was the first month in which they sold 100. This May they hit 1,000 a month for the first time. To begin with, the tents were made by a parasail company in Kent. It could not keep up with demand. No one else in Britain was interested in taking production on, so, reluctantly, they moved to a tent company in China. When they outran its capacity too, they moved into their own factory in China in June 2014. The staff had to be trained – each tent is hand-made as the stitching and textiles used, require that. But there was a much bigger problem. Chinese officials had been ‘persuaded’ that Alex and Kirk had pinched the design from their former suppliers. Within days of starting, the new plant was shut down. They had made an elementary error: not registering a set of patents in China itself. It took weeks of legal argument and a file of documents from Britain (their invoices from Kent and their patents from Newport), but they got the factory re-opened and production underway. In mid-April 2015, they received their full Chinese patent examination report and were, at last, in a proper position to show off any further attempts by copycats and fraudsters to close them down. We were lucky to have started after the new leadership of President Xi Jinping began its anti-corruption campaign. It was an important lesson for us. Now we also register our patents in any country where sales are likely. We are taking no chances. Sounds and looks very good! and is safety for the environment. Keep it up! That's a great idea. Thank you very much, It is a very interesting article. That's really awesome! I have to check it out! Wow, that's really awesome! I think that is much convenient and safier than classic hommock. I have never seen it before in Poland. I have to check it out! wow, really great idea. It is far more convenient than a hammock (which is also pretty good solution though) and much safier to use in open space. This doesn't seem like a good case study for the UKIPO to publicise as they appear to have provided a very poor service to Mr Shirley-Smith. It's So Amazing! Where i can buy this in Poland? I'm glad you like it. 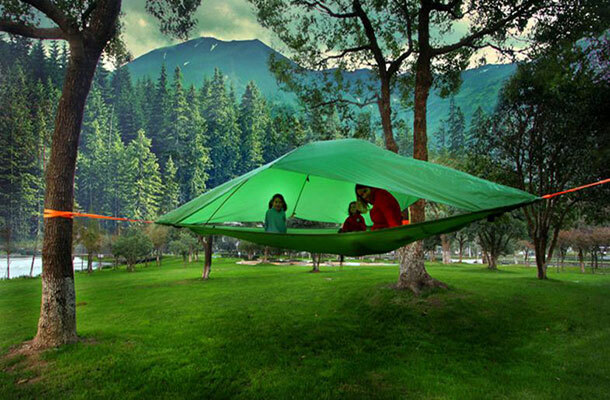 Tentsile is the name of the company to search for. Oh my gosh. This is so much my childhood dream, I had dreams like that - of being able to hide and at the same time, explore woods inside of some big unbreakable but transparent sphere. This, dare I say, is pretty close - it's a lot of sense of safety I think, when I look at those tents suspended over the ground. Mr Shirley-Smith filed a UK patent application for his product in September 2010 (GB2483669). He then requested examination of the application in September 2012. Shockingly, almost three years later the UKIPO is yet to issue a first exam report on the application. So did they file patent applications in China or not? If they've received an examination report, they must have done, so what was their "elementary error"? Perhaps they only filed the applications after the product was on sale but in that case the patents will not be valid.